No bundt cake this Saturday, as I am en route to a quick weekend in Minneapolis, which (coincidentally or not?) happens to be the Bundt motherland, home of Nordicware itself. Fate, obvs. Melissa's Matt sent this cookbook along for me in his stead, since he couldn't make it out to SF with her this time around. Bundt Cake Bliss: Delicious Desserts from Midwest Kitchens. I'm crazy about it. (Matt, you're the best!) Prepare for wild and woolly bundts to come, courtesy of the New York contingent. 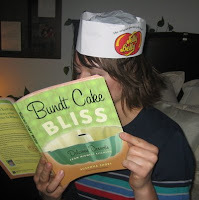 Dude, I need a Jelly Belly hairnet-hat!